Music Group has today (Wednesday 13th) announced the acquisition of professional loudspeaker manufacturer Turbosound, as part of the Group’s continued expansion. The addition of Turbosound is designed to allow Music Group to round off its professional and touring audio offerings alongside Klark Teknik and Midas. Turbosound now joins Midas and Klark Teknik as anchor brands to the Group’s on-going expansion into professional markets, with the combination of brands aimed at delivering complete system solutions to touring and install customers. It is expected that Turbosound will retain its own manufacturing, sales, marketing and distribution network worldwide, while benefiting from Music Group’s extensive infrastructure. 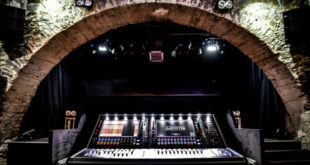 “We will invest heavily in positioning Turbosound at the very pinnacle of the industry, as we have done with Midas and Klark Teknik, where we have financed over $20 million in new automated manufacturing, quality control systems and engineering resources, including a new Center of Engineering Excellence in Manchester, UK,” added Behringer.